tried a salted egg pasta at a quite excellent dinner at petite menu earlier on 22.3.2014 & wanted to try cooking the dish. had 2 salted duck eggs left from a recent 12-course homecooked dinner where i tried the chinese style salted egg prawns, so decided to cook it for lunch for my son. i minced 2 salted egg yokes after boiling the eggs earlier. i had some browned garlic cloves in olive oil in the fridge leftover from the day before so i added that to a pan & fried 1 stalk of curry leaves (w/o the stem) to bring out the flavour, then i added the minced salted egg yokes. lastly i added 1/2cup of white wine & some sugar to taste (1 teaspoon). i had my spaghetti done as usual just below al dente. i decided to practice deep fry prawns instead the usual pan fry. i added fish sauce, sea salt & white pepper PLUS yuzu salad sauce & fresh egg yoke to a pack of shelled small prawns (about 20+) & seasoned. then i put 3 tablespoon flour in a bowl & heated a small saucepan of oil. i coated the prawns & dropped into the oil for a very quick fry. 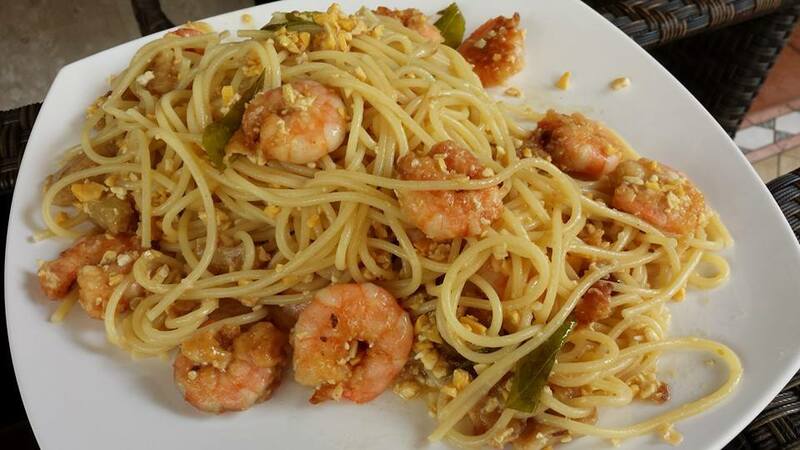 when all ingredients were ready, i reheated the pan with the salted egg sauce till it boiled, then i off the fire and added the spaghetti & tossed & lastly added the deep-fried prawns. i tasted the dish. 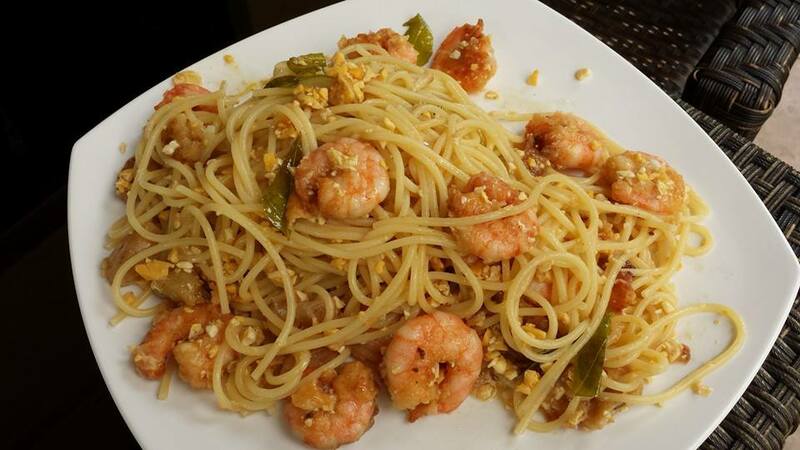 it was very tasty as good as my usual seafood alio olio. the deep-fried prawns were fresh & good too though nothing special. there was curry leaves flavour but i could not detect much of the salted egg flavour. while the dish was quite tasty & looked good with the colour & garnishing of the chopped salted egg yokes which also contributed texture, it was just another tasty dish & did not really stood up as a salted egg pasta. 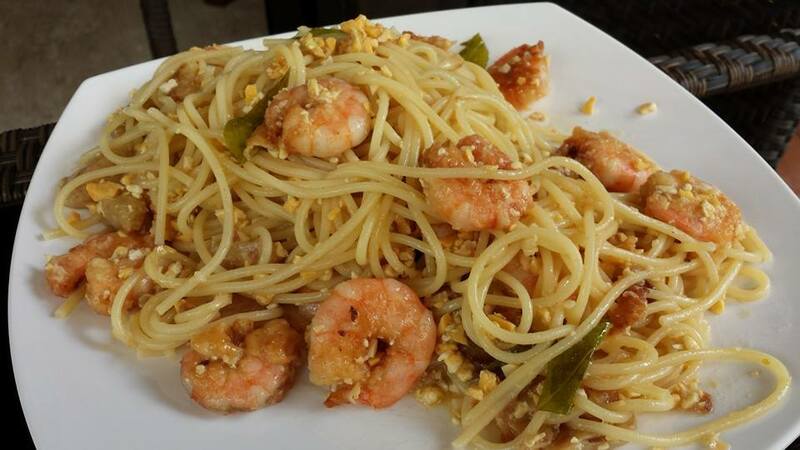 This entry was posted in Recipes and tagged curry leaves, deep-fried prawns, salted egg, yuzu. Bookmark the permalink.